Coral reefs develop below the surface of the ocean, which makes the use of remote sensing technologies for mapping reef systems much more challenging compared to mapping habitats like forests. US-based Planet’s optical satellite images each contain a rich record of how sunlight of specific wavelengths of colour have been absorbed and scattered both by the water column and by bottom features such as coral, algae, seagrass, rock, sand and rubble. By knowing how to decode wavelength signatures to understand what objects they have contacted, we can use satellite images to see in greater detail what we haven’t been able to see under water before. That said, interpreting images of the submerged coastal environment requires an understanding of all the interactions that are taking place in the water column. Water clarity: water clarity improves the team’s ability to map bottom features, since only visible light can penetrate the water column. Water clarity is influenced by organic (e.g. chlorophyll) and inorganic (e.g. sediment particles) matter suspended in the water column. The density and type of matter affects how the visible light gets absorbed and scattered. Water depth: blue light penetrates further than red light in water, which only penetrates a few meters. This means that shallow water has less absorption and scattering improving the ability to differentiate bottom features with optical sensors. Active sensors like radar are unable to penetrate the water column at all, which is why this project relies on passive remote sensing. Water roughness: rough surface water can reduce the ability to map substrate features compared to calm and flat water. Water movement: Dynamic changes in the water due to tides, wind and ocean currents cause water depth to vary and often encourage mixing of water column organic and inorganic matter, both of which make imagery harder to interpret. 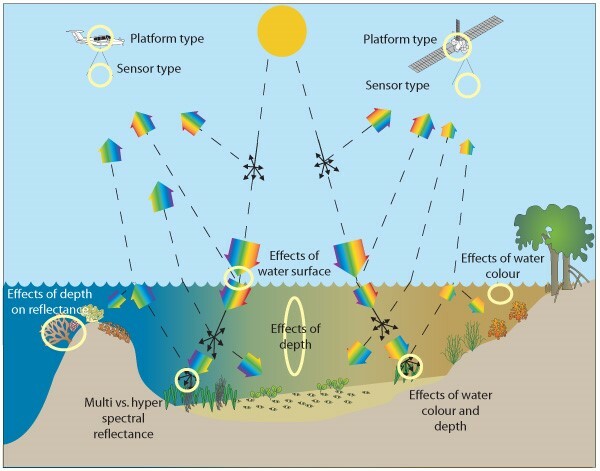 Clouds, shade and smoke all reduce the ability to use optical remote sensing to differentiate bottom features, a problem which is also experienced in terrestrial remote sensing. Planet’s unique extensive constellation of 180 Dove satellites allows the project to capture images over every single coral reef, several times each day, from which the team select the best conditions possible (e.g., no cloud, appropriate tidal level, minimal breaking waves etc.) in order to extract information from the imagery. We continue to work through these challenges to enhance our ability to map the world’s corals. Track our progress on the blog here, and explore the Allen Coral Atlas to see the first high resolution global map of the world’s corals come to life.